I kept having this debate with myself about how I would spend my precious minute and eight seconds (the duration of totality allotted to me where I ended up). Do I passively observe? Or do I try to capture the experience? Actually, people kept expecting me to take photos. They were excited for them in advance, and each time I tried to let them down gently—”I might just let the experts take the photos and sit back and enjoy the show”—I felt more and more like I was kidding myself. In the end I decided all the hours of solitude at the telescope over the last two years, all the practice, all the writing I’ve done here—they’ve engendered in me the confidence to photograph the eclipse up close, and I’d be disappointed in myself if I didn’t try. 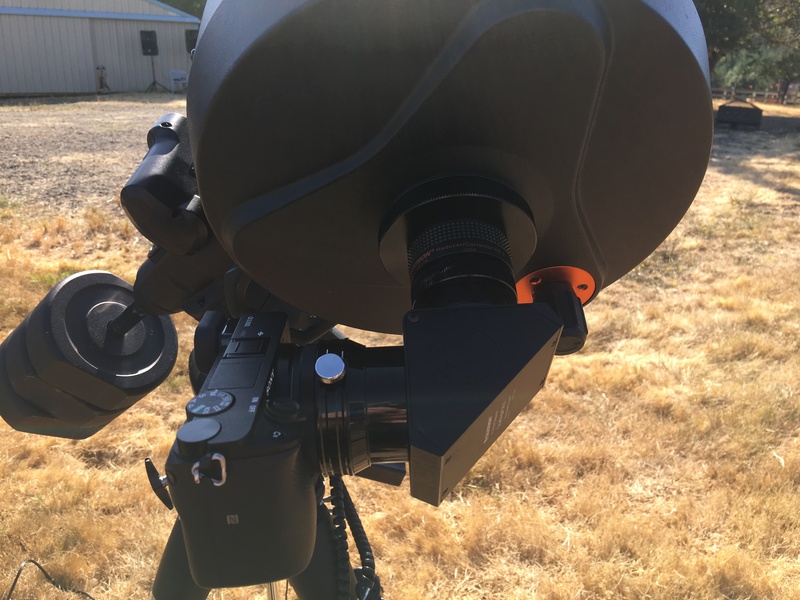 I drove to a friend’s farm for the eclipse, in the area of Molalla, Oregon, in the Willamette Valley (the same place where I photographed the Milky Way the month before). I had been invited to come the day before so that I could stay and watch the event the next day, and my host had also invited possibly a hundred people to come for a pig roast that Sunday. It was a kind of impromptu country fair, and I met a lot of people that day. As night fell, I set up the telescope and aimed it on Saturn so I could make sure the motors and optics were still in working order. There was a panicked moment when I thought I had lost the control cable for the declination motor! But after some fooling around with collimation and other setup, I got it aimed on Saturn and invited everyone to form a line to see. Nothing impresses quite like it! People began to turn in, and I stayed up a bit later to look at other parks of the Milky Way’s core. Quite randomly, as I shifted the telescope about the core, I happened upon a smudge I didn’t recognize but was rather bright. I couldn’t make out through the eyepiece quite what it was, so I found my camera and began photographing it for later identification. Later, after the whole thing was over and I got home, I turned to a program called solve-field from Astrometry.net. 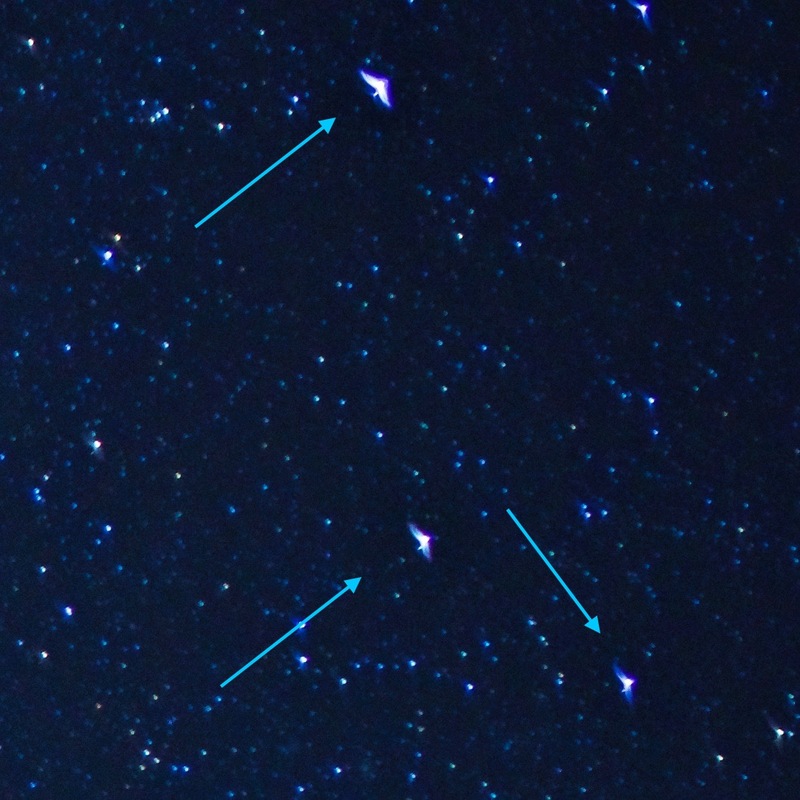 It used the star field in the background to determine the area of the sky this photo was taken in. 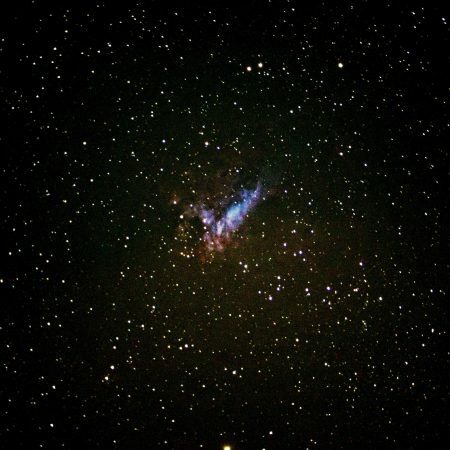 It plotted the nebula as the Omega Nebula. It’s one of my favorite photos of the weekend, and it was entirely happenstance! I was up early, having barely slept—new place, lots of people coming and going. There were dozens of people encamped where I was. I arose by seven and gradually made my way out. I determined where the sun would finally be and moved the telescope out to a prime spot (with the help of some sturdy new acquaintances—thanks, friends!). Next was putting on a filter. 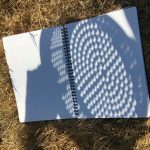 I had a couple of twelve-by-twelve pieces of solar filter sheet from Thousand Oaks Optical. Another couple of new friends lent me gaffer’s tape to secure it in place and cover any small gaps leftover. I wish I had a photo of the result, but believe me when I say it looked crude and took a couple of attempts to get right. 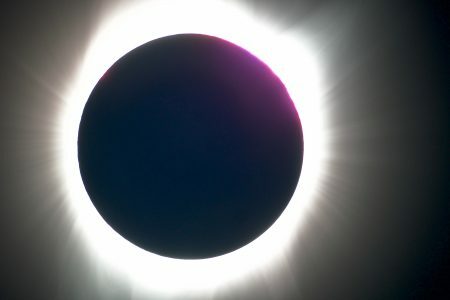 I looked through it at the sun in its fullness to see what it looked like. I had succeeded. I was ready. The telescope’s motor was tracking the sun. Now all I had to do was wait. Shortly after 9 a.m., we knew it was real. 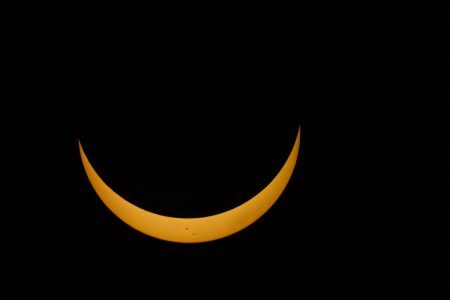 The limb of the moon touched the sun. We could see something we had never seen before. Things progressed surprisingly quickly from there. 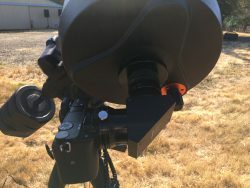 I have photos during several phases of partiality, but I mostly kept the camera away from the eyepiece of the telescope so that people could look through it. I found that as things advanced, the dozens of people in attendance began to line up, look through, and take smartphone pictures through the eyepiece. I didn’t want to interrupt this as much as I could. The closer we got, the more popular the telescope was. I got to see other signs of approaching totality, like the growing coolness of the air and the light gradually fading. 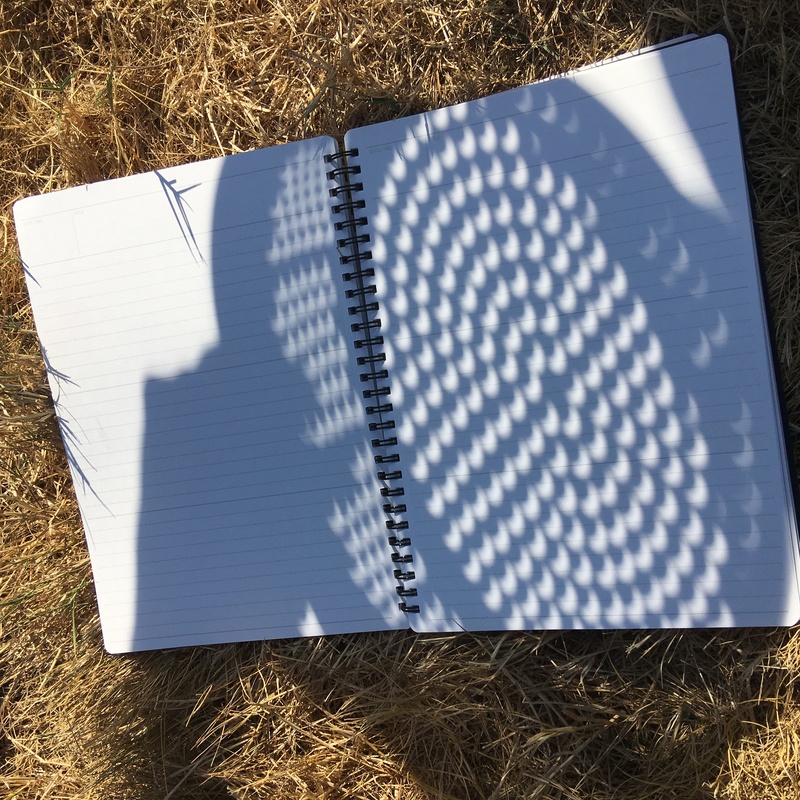 Someone also brought a colander so that we could see projections of the crescent through its holes. About ten minutes before, I began to take over the telescope for myself so I wouldn’t miss the chance to photograph the parts I really wanted to. 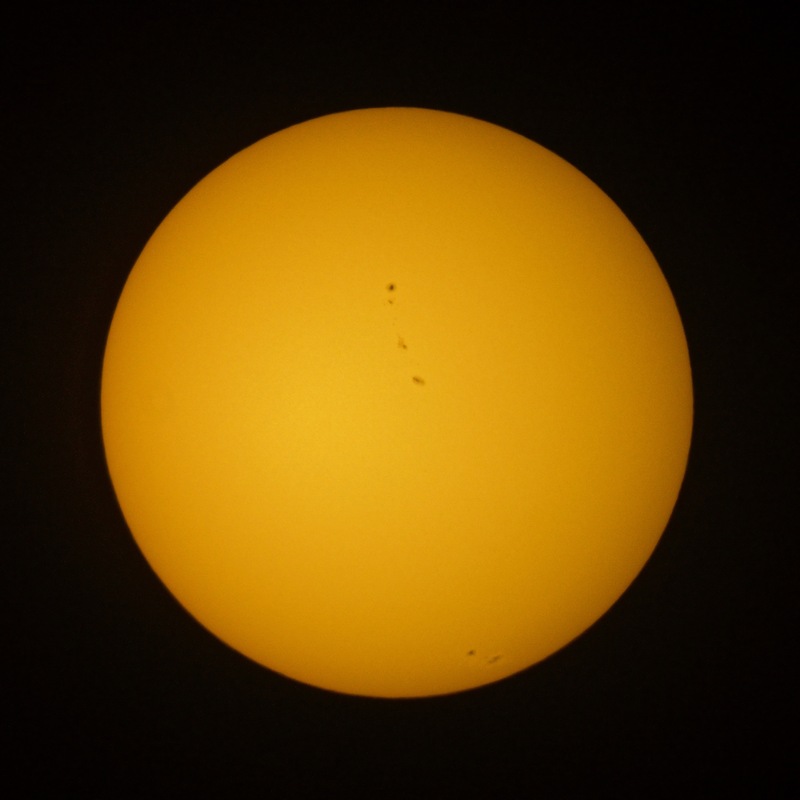 The sun itself became dimmer and dimmer—the same settings I had on the camera captured less and less light. I’ve had to play with these after the fact to make them look brighter. Toward totality, the sun began to look very slender. From this point, everything happened so quickly that the sky and earth changed from breath to breath. 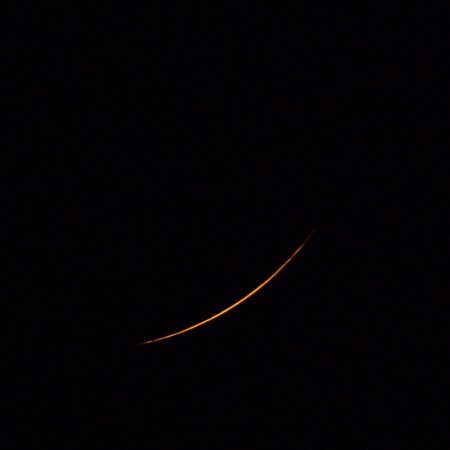 I watched the crescent thin almost perceptibly quickly, each photo different than the last. 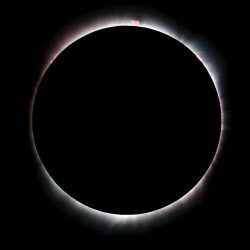 Just before totality, the entire grassy field was covered in shadow bands, which I remember clearly—we could see we were all at the bottom of a vast ocean of air, now that the light from the sun had grown point-like and highly collimated. Muted ripples of white crossed the pale grass quickly, as if we were sitting on the bottom of a shallow pool. I kept photographing as the eclipse continued, until I could get the barest crescent detectable through the filter. In that slight crescent, there are some places at the sides where the light seems almost mottled. It doesn’t form clean points. I can’t say that either the atmosphere nor my focus cooperated perfectly in that moment, but I suspect some of the irregularities (evident in other photos as well) are from the surface of the moon itself—its mountains and valleys interacting with the surface of the sun. Here I believe I captured the profile of the lunar geography along the edges of the crescent. Finally, the view in the camera went pitch black, and I looked up from the viewfinder with my bare eyes. The sun appeared to be an emptiness on fire. There is an ineffable quality to the experience, and I did my best to linger, knowing my time was so short with it. I was surprised how much color and dynamism I saw—a kind of unnatural fierce fire fringe lay just inside the corona of blue-white which feathered out, all of which circumscribed an inner full blackness. The sky beyond was deep blue-black. Outside of that, I saw Venus to the right. I looked for other planets, but I could not see Mars or Mercury (too close to the corona or sun, I suppose). I did not see Regulus, either. I saw other stars in the distance. It was not a full, pitch-black night around us, but it was a swirling night. I felt it palpably begin to get dewy, so quickly did the temperature plunge. In a moment, I ripped off the filter from my telescope. Once off, the camera could see again, and it saw spectacularly. 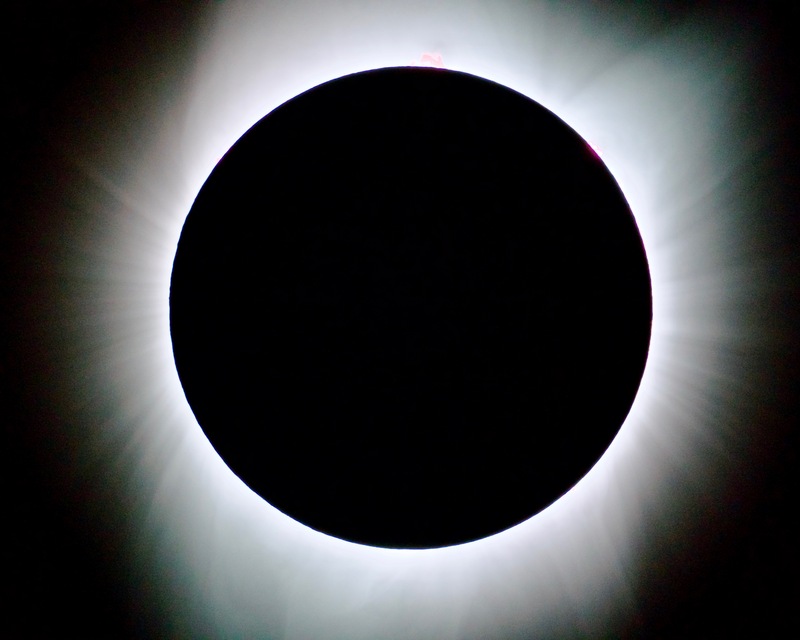 The sun eclipsed in totality, taken via Celestron eleven-inch telescope and Sony α6300 camera. I took as many photos as I could in the time allotted—about a minute. I didn’t dare mess with the settings I had. I simply set them as if I were photographing the moon (which I had practiced some weeks before) and took as many as I could in burst mode. I figured later I’d just try to process what I could and see if anything turned out okay. Incredibly, they did, though even these could not capture what the eye saw. 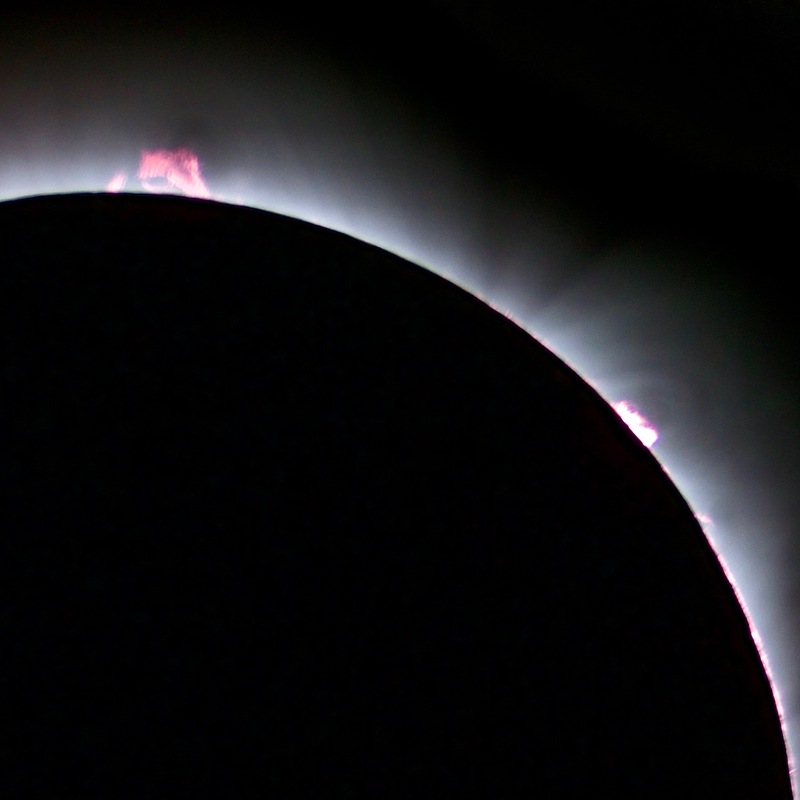 I was amazed to see the solar prominences in my photos as well as I could. I found that if I processed some of the photos a particular way, I could even get a clearer view of these prominences and of the fierce orange I recalled. As totality ended, the light began to overwhelm my sensor again. If I had had more practice, I would have backed off the exposure length or ISO to capture a diamond ring effect, but I did not have this practice, and it happened so quickly that I did not adjust in the moment. Instead, the light began to overwhelm my sensor, revealing the sun in all its power as dramatic distortions. I liked the drama of it, even if I missed the special diamond ring effect. The color was really interesting (that’s more or less how it came out of the camera). Within seconds after, totality had ended, and I had to race to slam back on my lens cap on my telescope before I damaged my camera or optics. 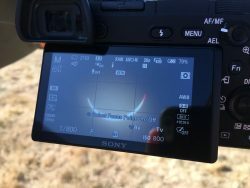 Now I have hindsight to think about how I spent the eclipse: about whether I should have put all the equipment away and let the experts do the photography so that I could enjoy the spectacle itself, or if I was right to join in by photographing it myself. I think if I had had less practice, I might have come away frustrated, with poorer photos to show, and I might have missed actually looking down to see shadow bands (I yelled out, “shadow bands!” to call them out to others) or missed out on looking up. I might have ruined the moment. But all the time I had spent with the stars and moon had prepared me, and I came away with photos that didn’t disappoint me, nor did they detract from the experience in the moment. In fact, having the telescope set up at all was the best part, and it is the reason I do not regret the attempt. Dozens of people came and went, looking through it to see what they could, using their smart phone to take away their own photos, including lots of children. If I had not bothered, they would not have gotten to see that. I’m glad I could provide a close-up view that only a minority got. I’m not sure if “beginning astrophotography” fits me, still, but I’m keeping it. I’ve come a long way in the last two years, but I know I have so much to learn. I spent so much time wondering if I should “let the experts” handle the photography of the eclipse, only to learn I had somehow become one of the experts at some point. 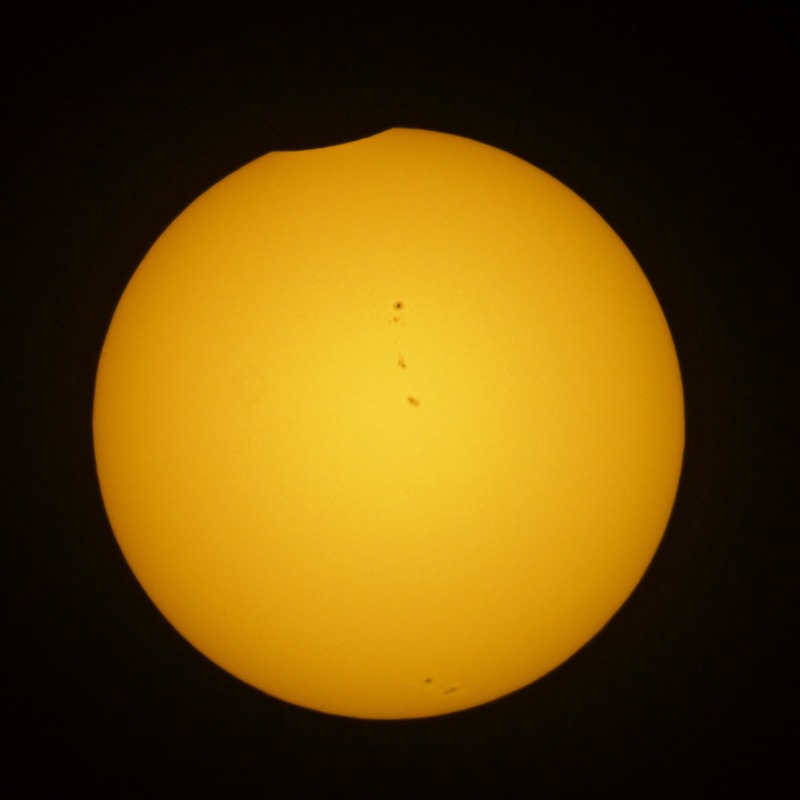 This eclipse marked for me an incredible turning point as an amateur astronomer, and I hope I keep learning and growing. If I had one regret, actually, the journey home might be it. 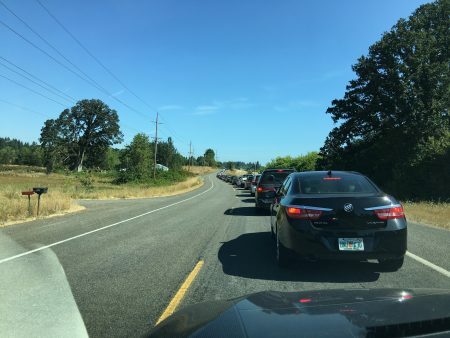 It took a couple of hours to get home, and I found myself stuck still in a line of cars like this. Photo of the night sky showing the core of the Milky Way on the horizon, taken 22 Jul 2017 at 10:44 p.m. PDT. “You know, ‘galaxy’ means ‘milky,'” I said, still looking up. “What? 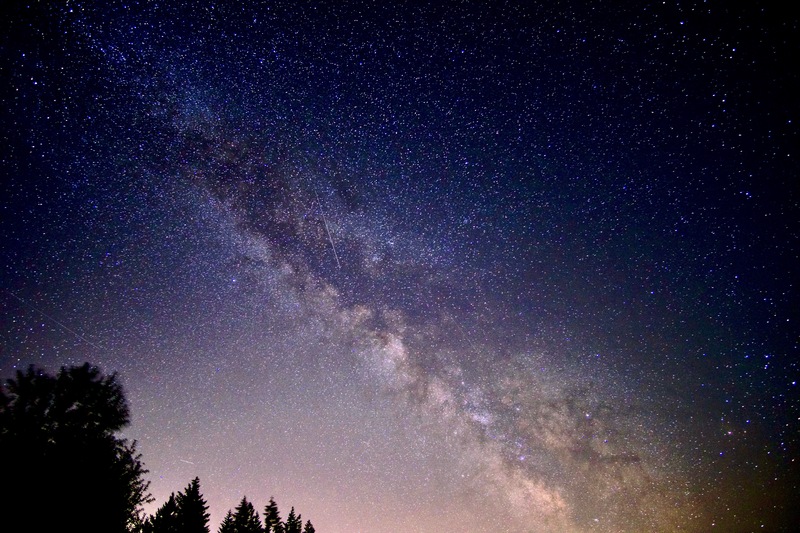 No way,” my friend, who was stargazing with me with her own camera, said. I was taking photos with a new friend at her farm south of Portland. 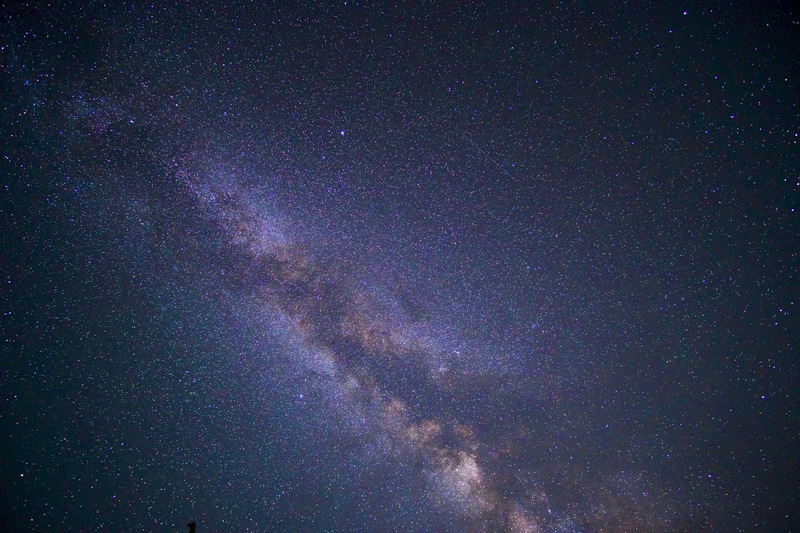 I remain extremely grateful to her for allowing me to do so because they allowed me to my first photos of the core of the galaxy unaffected by light pollution. The photo above was processed somewhat delicately to improve the white balance and the colors and brighten things up a bit, but that’s more or less how it came out of the camera. Taking photos of the sky at large is a very different activity than taking photos of individual objects through a telescope. Chiefly, there is no telescope. None of this post will discuss using a telescope. I took all these photos with my same mirrorless camera, the Sony α6300, and a tripod. 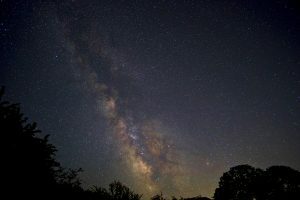 To adapt this camera to wide-field night sky images of the Milky Way, there are two big differences from ordinary photography: for one, using a long exposure and high ISO, and for two, using a suitable lens. When I started last year, I was practicing blind, experimenting in wintry months, guessing at settings, and using a 32 mm lens with significant shortcomings for night-sky photography. To make improvements, I’m grateful for information I got from Lonely Speck, which I adapted to suit me. First, most of the job of collecting a night-sky image is accomplished by exposing with a high ISO and a long exposure period. This means trucking out to a dark site—this activity is absolutely impossible anywhere near a city and impractical in a suburb. You also have to have a camera capable of manual control over its ISO and exposure length, among other things. Detail of the night sky, looking into Cygnus, taken with ISO 800. For my early wide-field attempts, I was afraid to raise the ISO higher than about 1600. I took some experimental shots with the ISO as high as I could go, but few were in the middle ground. I assumed these photos would be unusably noisy. Therefore, the photos which turned out best were at ISO 800, but to bring out any detail, I had to push them dramatically, such that they looked artificial. I was amazed to learn this. The article goes on to explain the conditions under which this occurs and how. This meant that I was free to amp up the ISO on my photos considerably. The other consideration was exposure length. Mostly, the goal is to expose as long as possible before stars stop being points of light and start being streaks. 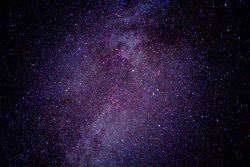 How long this takes is entirely a function of the focal length of the camera—that is, the wider the field of view, the smaller the points of light are, so the less noticeable it becomes when stars seem to “move” across the field of view. 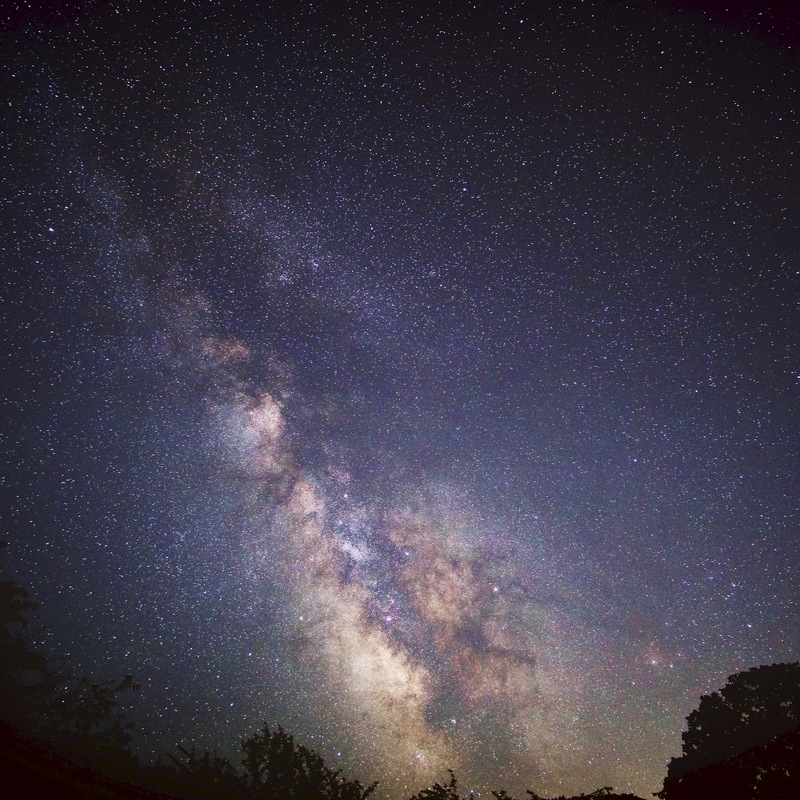 The lens I had used before was a bit longer than typically used for Milky Way photography. It’s only able to capture about the size of a constellation. That meant that stars would appear to move if I exposed longer than about fifteen seconds. Add these together, and I was taking in a lot less light than my camera was capable of. On top of that, my lens was not designed for astrophotography, meaning that it introduced significant distortions, called aberrations, to each photo around the edges. I had noticed from the first images I took that I had weird comet-looking distortions around the edges of my photos, but I didn’t know why. All the bright stars ended up looking this way. I figured I might be able to avoid these distortions by stopping down the lens somewhat (and I would have been right, as I later learned), but that would have meant blocking even more light. Luckily, there was another post on Lonely Speck that explained all about these distortions, called aberrations. 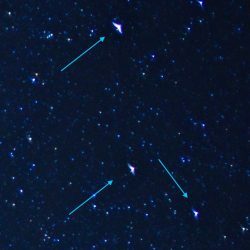 I learned that these shapes were a combination of coma (which caused the light from the star to smear inward toward the center of the photo) and tangential astigmatism (which butterflied the distortion apart parallel to the radius running from the center to the star). These were in-built distortions of the lens. It’s not necessarily that I had a bad lens—indeed, this was a Zeiss Touit f/1.8, an extremely good portrait lens. It just wasn’t designed for work where spots of light in the periphery were meant to be precise dots. I found out there are classes of lenses built by Samyang (also known as Rokinon lenses, among others) designed to minimize these aberrations, also having extremely short focal lengths (meaning, really wide fields of view). 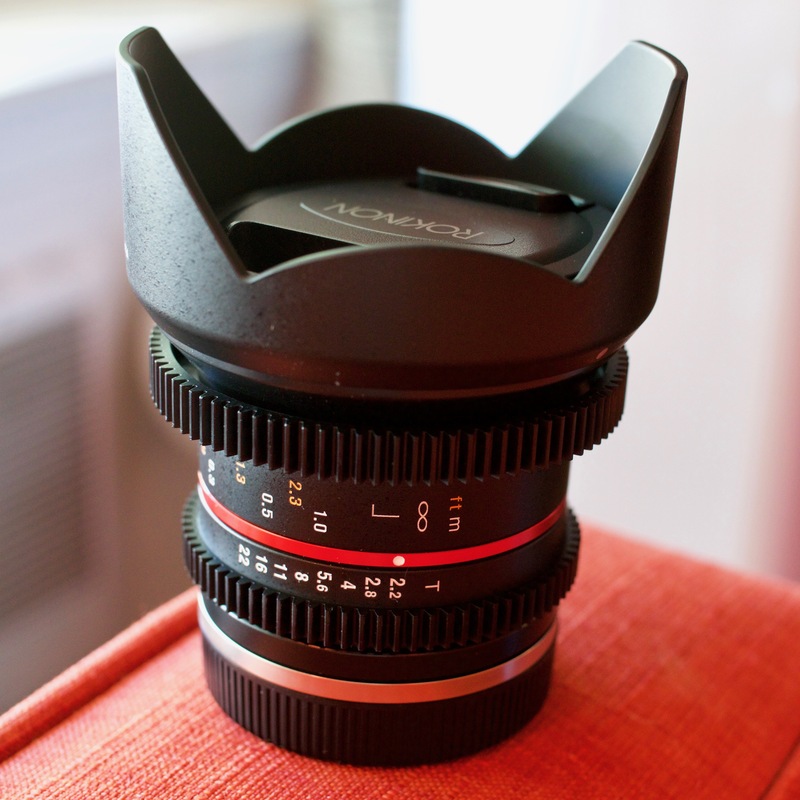 For my birthday in June, I treated myself to a Rokinon Cine CV12M-E 12mm T2.2 Cine fixed lens. This is the lens I’ve used for all the photos of the Milky Way since then. I’ve taken two batches of photos of the Milky Way since getting the lens and figuring out the right direction for settings. For the first batch, I went to Stub Stewart State Park and waited till about eleven at night. It’s summer, so that’s when astronomical dusk occurs, and you can look up and see the Milky Way (which is visible from that site, though a bit washed out). 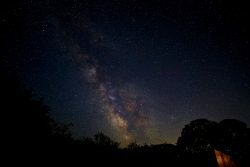 Being summer, as well, the core of the galaxy is visible in the south, which I’ve wanted to photograph for a long time. I followed the instructions from Lonely Speck rather closely, with respect to ISO and exposure, and I found I got wonderful results. In this case, I exposed for twenty-five seconds, and I used ISO 3200. The results exceeded my expectations. As I processed them later, I found that I captured a lot of the light pollution from the city (which was in the distance in the southeast), and that presented difficulties in processing the photos without bringing out splotches of unnatural color. I consider my attempts from that night now to be middling, and my ability to process them have evolved considerably as well. I was extremely lucky enough to have a very helpful and happy friend who let me come to her farm and do more night-time photography. 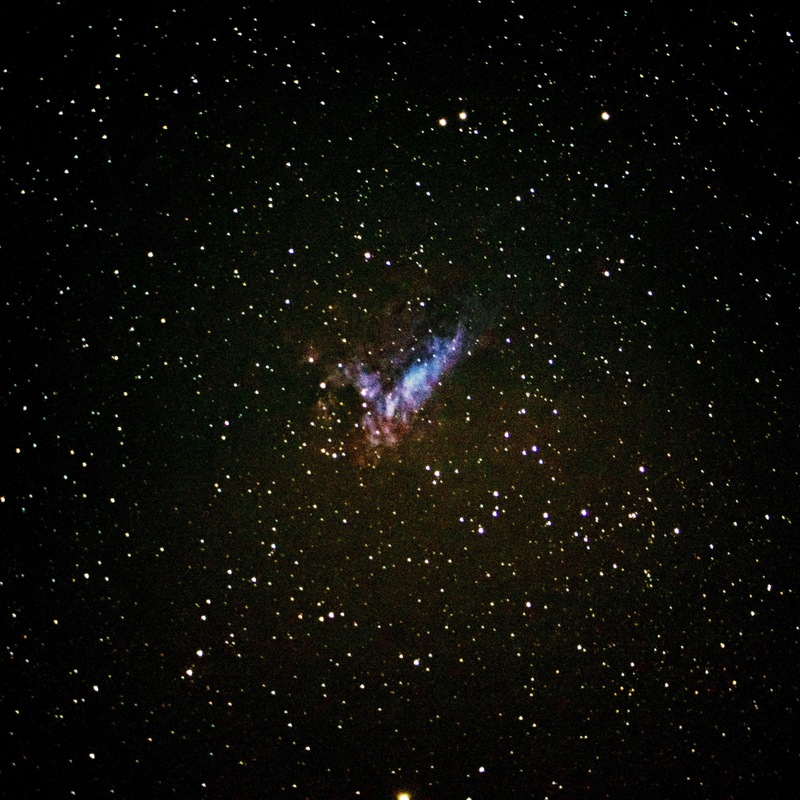 Because her farm was south of Portland, the core of the galaxy was facing away from all the light pollution. The photos at the top of the post represent some taken from this attempt. Here at the farm, I decided to lessen both the exposure length of time (down to twenty seconds) and the ISO (down to 2000). The earlier settings, I had found, seemed almost too aggressive for the conditions, though I may revisit them if I’m at a darker site. But twenty seconds and ISO 2000 turned out to be perfect. The photos looked gorgeous right off the camera, almost without editing at all. The results had delicate bands of dust and light in them that were considerable easier to work with as I processed them on my computer. I took enough that night that I’ve been able to find lots of different ways to process each and experiment with what I like. For some, I’ve tried wild color combinations and gradients. I’ve tried delicate forms of processing or pushing others as far as they’ll go. I’ve learned to duplicate a photo many times over so I can manipulate it in many different directions and compare the results. This post has been about changes I’ve introduced to the photography process, and in a future post, I’d like to talk about processing a bit more (basically editing the RAW photos to make them pop). I’d like to get better at that first, though.